One of my favorite songs to bring out in the spring is 2, 4, 6, 8. I can use this with any grade level that is preparing or practicing beat vs. rhythm or is practicing ta and titi. The dance that I learned with this song is set up in longways sets with each student facing their partner. I should have made my kids listen a few more times before joining in on the singing, as you will hear that some of them throw in a la and make the last phrase ta titi ta ta. Once we really honed in on the rhythm of the song and read it with ta's and titi's that fixed that right up. 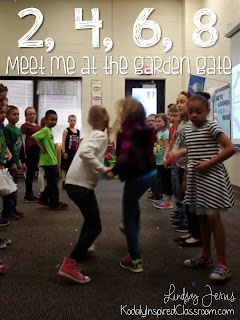 Here are some of the visuals and manipulative I use with this song after they have learned the dance. When practicing steady beat or working on beat vs. rhythm, I can pull out this slide and students can pat beat on laps while I point or they can take turns tapping at the board like the teacher. I also have slides for prepping the rhythm of the words as well as with stick notation. Click here to find these ready made slides to use in your classroom. On a different day in ta and titi practice stage, I divide the class into small groups and I pass out baggies that have foam flowers that I picked up from the dollar bin. On the flowers, I have notated (in stick notation) the phrases of the song with one phrase on each flower. Students work in groups to put the song together. When they have the song notated I come around to each group and they perform it for me. I hope this gives you some fun ideas to try with your kids!